Click to see the most recent edition of Leadline, the Region 1 newsletter of record. We're going to have a Leisure Division rides at all our competitions this year. To give interested riders a taste of what our rides are like, Sheila Christenson put on a NATRC clinic, which had twenty participants and five more on the waiting list. It was a tremendous success: the participants demonstrated serious horsemanship skills and also seemed to have a great time. Here's a story about the clinic, from a volunteer's point of view. It's a little delayed, but we have a story about the 2016 CMDTRA (Mt Diablo) ride. An awful lot happened on that ride. Take a look at the photos from the 2016 Cowboy Camp Ride and Clinic. Linda Thomason took them and they're worth paging through: if you rode, you and your horse are in there somewhere! New photos from the 2016 CMDTRA Spring Ride. Lisa Keenan, a professional photographer and P&R volunteer, took the photos and they're great. Thanks, Lisa, for taking them and letting us use them! Kaysha, the NATRC rider who, as a junior, guided your webmaster through her first NATRC ride, returned to competition after getting married, having a child and starting a career. Kaysha's story is about why she has started riding again and how she feels about it, now that's she's returned, and what her plans are. The National Board of Directors (NBOD) of NATRC has published the NATRC Strategic Plan. It outlines our current status, our goals as an organization, and our initiatives to meet those goals. Take a look; our regional board members are interested in your critiques and ideas. You can get in touch with them on our Contact Us page. The Gold Rush Shuffle is a three day endurance event held the Friday, Saturday, and Sunday after Thanksgiving every year. Trisha Taniguchi and I did the Saturday 50 miler on our tried and true NATRC mounts, Jake and Sunny. Neither of us realized that the other was going to be there, but we got lucky and bumped into each other the night before. Trisha and I appear to be in synch: not only did we choose the same endurance ride as our debut event, when we were done we both had to write about it. Click here to read Trisha's Gold Rush Shuffle blog entry. And my story is Hello, AERC!. The 2015 Round Valley NATRC ride was held a couple of weeks ago. It's been a pretty challenging ride for the past couple of years, but this year, the stars aligned. If you didn't make the ride, read about it in Return to Round Valley. Kathryn Lewandowsky, a Region 1 rider from Washington state, has written an article about the loss of her mare, Lily, in the course of an endurance ride, the steps she took to find Lily, and the ultimate outcome. Kathryn has done a wonderful job of telling a moving story, while making some strong points about how to handle a fairly frequently occuring sitation. Please take a look at Lily's Story. Stephanie Swain, a Region 1 Director and a regular rider, has written a great . . . opinion piece on horsemanship judging. It first appeared in the Leadline, so you may already have read it, but if you haven't, take the time. It is a clear presentation the problems of having horsemanship judged by a single person - and how to address the issues that arise and to profit from the process: To Be Judged or Not to Be Judged. Mary-Ellis Arnold a season off from NATRC rides - she has a new baby boy (congratulations Ellis!) - but is clearly scheming to return in style as soon as she can. In aid of that she started working with a trainer to keep her mustang, Sebastian, in shape, and it sounds like the trainer is tailoring the training to Competitive Trail Riding. Mary-Ellis has written a blog about one session in which her trainer worked on speeding up Sebastian's walk. Read the blog entry here. The 2012 Georgetown NATRC ride was Laura Harvey's first effort as a ride manager. It was a delightful ride - a challenging, clearly marked trail through some beautiful scenery - but that was only on the surface! Laura tells the REAL story in Confessions of a First Time Ride Manager. Check it out. Kay Lieberknecht has been bringing along her young gelding, Lakota, for the last couple of years. He was a goofy as could be, but obviously crazy about Kay (and she was equally obviously as crazy about him) and he was also very curious about this NATRC thing. They were an inspiration just to watch. Kay recently lost Lakota. Read her tribute to him, please; it really brought home to me how quickly things happen with horses, and how important it is to treasure my time with my snooty little mare. Catherine de la Cruz has been taking dressage lessons while preparing for her first NATRC ride. On a recent trail ride, the nickel dropped and she figured out the role of Dressage on the Trail. Take a look and see if it matches up with your experience. By the way, her ride at Jackson Forest was successful - read about it in Ride Stories below. Karlie Johnson and Jodie Nelson, two of our Region 1 junior riders, have come up with a comparison of cars and horses, complete with illustrative photos. Take a look at "Horses and Cars". 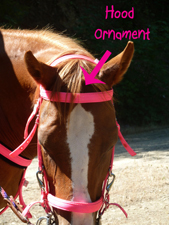 Angie Meroshnekoff has written an article about one of the unexpected joys of marking trail for our rides. Take a look at "A Jewel on the Trail" - it may inspire you to help ribbon a ride the next time the call goes out! Catherine de la Cruz, who was a fellow-attendee at this Summer's White Dog Ranch Ladies Trail Camp, finished her first NATRC ride at Jackson Forest. At age 74. Here's her story. Round Valley Photos - 2013: Kimberly Naugle opted to take pictures of us all instead of riding at Round Valley - Thanks, Kimberly. It was a great ride: it was warm, but way better than last year and the trail markings were superb: even I couldn't get lost. Take a look. And photos from the Jackson Forest Ride, 2013, taken by Bob Dorsey of Catchlight Studios, are also on-line, and available for purchase from Bob. Our rides are getting to be a habit with Ellis and Sebastian - here's Ellis's 2012 Round Valley blog entry. Check it out: the photos are great, and her description of The Killer Rock resonates. Ellis does it again with a story about Cowboy Camp, 2012. I have to say, I laughed out loud while reading this one! A second story about the Mt Diablo Spring Ride, from Mary-Ellis Arnold. This was her horse, Sebastian's first NATRC ride. The Mt Diablo Spring Ride (CMDTRA)">Mt Diablo Spring Ride (CMDTRA) in 2012. The Inaugural Cowboy Camp ride in 2011. We noticed a misspelled name in this story ("Carol" should be "Karel" - sorry, Karel!) and a couple of rules misinterpretations, but, in our opinion, it still manages to tell the tale - so no letters to the editor, please. A Link to the Story of a Ride . . . The CMDTRA Diablo Springs ride is one of the longest running competitive trail rides in the country - you can read about their first ride in 1941, which ran from Concord to Mt Diablo and back. Trail News is the Region 1 trail report. Recent issues are available here as pdf files. And if you happen to be interested, here's where you can find the Region 1 Bylaws. Leadline is the Region 1 newsletter. Recent issues are available here as pdf files. Hoof Beats North is a competitive trail newsletter aimed at the Alaskan community. There's lots of good information here! The electronic version of the current issue of Hoof Print, the national NATRC newsletter, is available here, or you can go to the National NATRC site and look under "Documents". This section has a information that might be useful to you as you gear up for a ride: answers to frequently asked questions and answers to infrequently-asked-questions-that-should-be-asked-more-often, first-ride stories, "how-tos", etc. And if you're ready to join . . . here's a link to a pdf of the NATRC Membership Application. We'll see you on the trail! A Day in the Life of a NATRC Ride: an excellent description of what goes on at a NATRC ride from pulling into the camping area to getting the judge's evaluations, written by the human member of the 2011 Region 1 Novice Horse and Rider Team of the Year. Ride Your Own Ride is a set of tips on how to stay with your horse, and make decisions based on his behavior, rather than just following the leader. Horsemanship Judging Explained. (By the way, I gave it that title - not Jamie!) is an overview of how points are allocated in horsemanship judging, and some specifics on what the judges are looking for. So you want to bring a child on a NATRC ride, but have some questions? Check out this article by Kay Lieberknecht and Angie Meroshnekoff, who have successfully introduced many kids to our sport: "Taking Juniors to NATRC Rides". Or you want to ease a friend into a NATRC ride - how about going to "NATRC_101"? This article is about a camp organized by Kay Lieberknecht to introduce riders to "the NATRC Way". The experienced riders brought along new riders, so there were plenty of good examples to follow, then the group went through the process of a NATRC ride, complete with potluck and vetting in on Friday night. Frequently Asked Questions A frequently updated list of common questions. If you submit a question via the Contact Us page, it may end up on this list. And finally, things to bring to a NATRC ride, an exhaustive list of the things you might need at a NATRC ride. Sunny Does NATRC: A first time rider and first time mare take to the trail on a ride being put on for the first time. Whoo Hoo! Sheila Christiansen completed her first NATRC ride at Mt Diablo in the 2014 CMDTRA ride. She had been considering doing one for quite some time, but didn't make the plunge until she moved to California from the midwest. Evidently, there's a different definition of "sort of hilly" back there . . . Read The Whole Story in Conquering Mt. Diablo - What a Place to Start!. 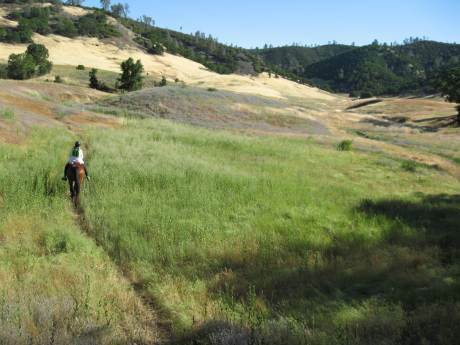 For a different perspective on the CMDTRA ride, try NATRC's Mount Diablo Ride, Viewed through the ears of an aspiring endurance horse. This was also Melissa's first NATRC ride, but she and her mare have completed several endurance rides.